Don’t worry about your Samsung Galaxy tablet controlling too much of your life: The tablet harbors no insidious intelligence, and the Robot Revolution is still years away. Until then, you can use your tablet’s listening capabilities to enjoy a feature called Google Now. It’s not quite like having your own personal Jeeves, but it’s on its way. Google Now must be activated on your Galaxy Note or Galaxy Tab. To do so, start the Google app, found directly on the Apps screen or in the Google folder on the Apps screen. 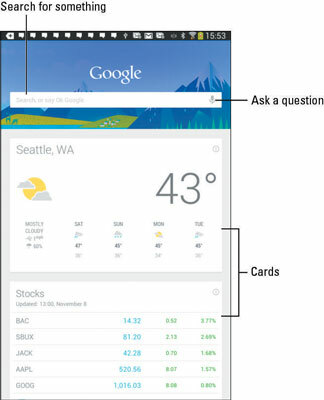 Obey the prompts on the screen to obtain Google Now. You might have to touch the Get Google Now link first. Touch the Google app to start Google Now, or perform a Google search by using the Google Search widget on the Home screen. A typical Google Now screen is shown below. Below the Search text box, you’ll find cards. The variety and number of cards depend on how often you use Google Now. The more the app learns about you, the more cards appear. One way to have a lot of fun is to use the Google Now app verbally. Just say “Okay Google.” Say it out loud. Any time you see the Google Now app, it’s listening to you. Or when the app is being stubborn, touch the Microphone icon. How many euros equal $25? What is 103 divided by 6? Where is the nearest Canadian restaurant? What’s the score of the Lakers–Celtics game? When asked such questions, Google Now responds with a card as well as a verbal reply. When a verbal reply isn’t available, Google search results are displayed. You can use Google Now features also by touching the Google Search widget. That widget normally comes preinstalled on the Home screen. If not, you can add it there. You cannot manually add cards to the Google Now screen. The only way to get more cards to show up is to use Google Now.